Staphylococcus bacteremia is a common and life-threatening medical emergency, but it is treatable with appropriate antibiotic therapy. To identify opportunities that may reduce morbidity and mortality associated with S. aureus, we analyzed data from 293,094 chronic hemodialysis outpatients to characterize practices of antibiotic selection. In the study population, the overall rate of bacteremia was 15.4 per 100 outpatient-years; the incidence rate for methicillin-sensitive (MSSA) was 2.1 per 100 outpatient-years, and the incidence rate for methicillin-resistant (MRSA) S. aureus was 1.9 per 100 outpatient-years. One week after the collection of the index blood culture, 56.1% of outpatients with MSSA bacteremia were receiving vancomycin, and 16.7% of outpatients with MSSA were receiving cefazolin. Among MSSA-bacteremic patients who did not die or get hospitalized 1 week after blood culture collection, use of cefazolin was associated with a 38% lower risk for hospitalization or death compared with vancomycin (adjusted HR=0.62, 95% CI=0.46–0.84). In conclusion, vancomycin is commonly used to treat MSSA bacteremia in outpatients receiving chronic dialysis, but there may be more risk of treatment failure than observed among those individuals who receive a β-lactam antibiotic such as cefazolin. Taken altogether, S. aureus bacteremia is especially relevant to all ESRD patients, because it is common and life-threatening but treatable with appropriate therapy. Antibiotic prescribing practices and their associated outcomes have not been well described, particularly in the outpatient ESRD population. In this study, we linked microbiology and clinical data within a large national network of dialysis clinics to estimate the US prevalence of antimicrobial use for the treatment of S. aureus bloodstream infection. We evaluated the trends in vancomycin and cefazolin prescription over a 5-year period and associated the use of each antibiotic with subsequent hospitalization or death related to infection. We reviewed blood culture specimens collected from 293,094 hemodialysis outpatients from January 1, 2006 to December 31, 2010. In this population, the overall bloodstream infection rate was 15.4 per 100 outpatient years. Culture-documented S. aureus bloodstream infection occurred at a rate of 4.0 per 100 outpatient years. Additional analyses showed that the rate was 2.1 per 100 outpatient years for methicillin-susceptible S. aureus (MSSA) bacteremia and 1.9 per 100 outpatient years for methicillin-resistant S. aureus (MRSA) bacteremia. The combined rate of vancomycin intermediate-resistant S. aureus and vancomycin intermediate-resistant enterococcus bacteremia was 0.15 per 100 outpatient years. The highest rates of bloodstream infection were seen in patients who dialyzed through a venous catheter, were febrile, or had an elevated white blood cell count (Supplemental Table 1). A schematic diagram depicts how the data were collected and the inclusion and exclusion criteria used (Supplemental Figure 1). One week after blood culture collection, 74.7% of outpatients with MRSA were treated with vancomycin, which was the predominant antibiotic that was prescribed (Figure 1B). Similarly, 56.1% of outpatients with MSSA bacteremia were treated with vancomycin, and 16.7% of outpatients were treated with cefazolin (P<0.001) 1 week after blood specimen collection (Figure 1A). Even after 2 weeks, more than two times as many patients with MSSA were prescribed vancomycin compared with cefazolin. Prevalence of vancomycin, cefazolin, and other antibiotic use in ESRD patients with S. aureus bloodstream infection. (A) Methicillin-susceptible S. aureus bloodstream infection and (B) methicillin-resistant S. aureus bloodstream infection. Note that these time series curves were not mutually exclusive. For example, a patient administered both vancomycin and cefazolin at a given point in time would be enumerated in both the vancomycin and cefazolin groups. Over the 5-year study period, vancomycin became increasingly the antibiotic of choice for the treatment of MSSA bloodstream infections (Figure 2A). For example, in 2006, 49.4% of MSSA bacteremic patients received vancomycin; by 2010, the prevalence increased to 66.4% (correlationyear×vancomycin=0.87, P<0.001). 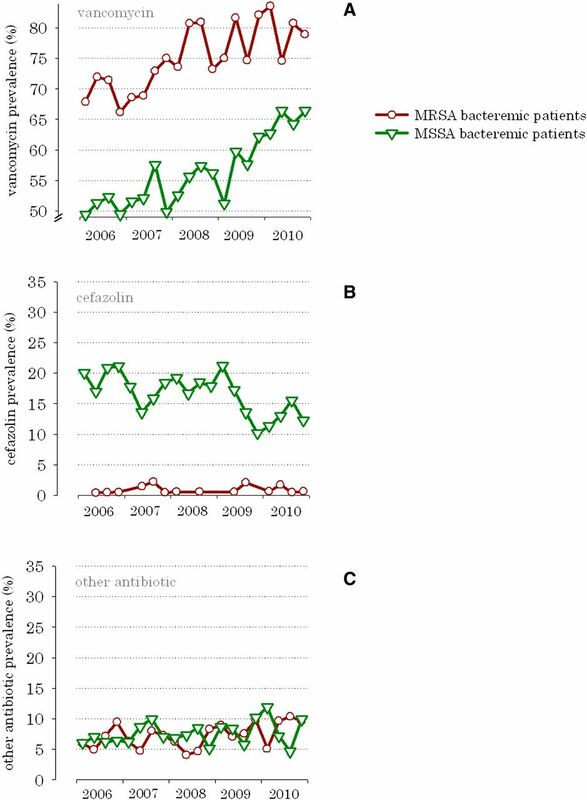 Conversely, cefazolin use for MSSA bacteremia decreased by 8.0% over the same time period (correlationyear×cefazolin=−0.70, P<0.001) (Figure 2B). Increasing prevalence of vancomycin versus cefazolin and other antibiotic use in ESRD patients with S. aureus bloodstream infection 1 week after blood specimen collection, from 2006 to 2010. (A) Prevalence of vancomycin, (B) prevalence of cefazolin, and (C) prevalence of other antibiotics. Patient characteristics were not substantially different in subjects who were prescribed vancomycin, cefazolin, or other antibiotics, with the exceptions of race in MSSA, nosocomial infection rate in MRSA, and concurrent aminoglycoside use and allergies in both groups (Tables 1 and 2). There were no clinically meaningful differences in age, frequency of catheters use, and vancomycin minimal inhibitory concentrations. In vancomycin-treated patients, the mean vancomycin trough level was 13.4 mcg/ml in MSSA bacteremic subjects and 12.3 mcg/ml in MRSA bacteremic subjects. In survival analyses, cefazolin was associated with a 38% lower combined risk of hospitalization or death from infection in MSSA bacteremia (hazard ratio [HR]=0.62, 95% confidence interval [CI]=0.46–0.84) (Figure 3 and Table 3) compared with vancomycin. Similarly, the risk of sepsis was reduced by 48% (HR=0.52, 95% CI=0.33–0.89) when MSSA bacteremia was treated with cefazolin. As expected in MRSA bacteremia, vancomycin was associated with the best outcomes (Figure 3 and Table 4). There were no statistically significant associations between the choice of antibiotic and the subsequent risk of vancomycin-resistant bloodstream infection (Tables 3 and 4). Combined risk of hospitalization or death from infection in ESRD patients with S. aureus bloodstream infection by antimicrobial therapy. (A) Methicillin-susceptible S. aureus bloodstream infection and (B) methicillin-resistant S. aureus bloodstream infection. *Percent of population without death or hospitalization from infection. **The cefazolin group (n=16) was omitted, because the sample size was too small, and there were too few outcome events. Note that 15.4% of MSSA bacteremia patients had a recurrent positive MSSA blood culture within 60 days. Similarly, 20% of MRSA patients had a recurrent bacteremia. We performed a series of sensitivity analyses to validate the association between cefazolin (versus vancomycin) and decreased hospitalization or death from infection in MSSA patients. We initially excluded all MSSA patients with a documented cefazolin or penicillin allergy from the study cohort (7% of patients) and found that most outpatients with MSSA were still treated with vancomycin (47.0%) rather than cefazolin (25.1%); furthermore, cefazolin was still associated with a decrease in hospitalization or death from infection compared with vancomycin (HR=0.62, 95% CI=0.45–0.85) in patients with MSSA. Because some patients will have repeatedly positive blood cultures, we recalculated the adjusted HRs in patients on their first positive blood culture over a 60-day window. When this recalculation was done, cefazolin was still associated with reduced hospitalization or death from infection (HR=0.50, 95% CI=0.35–0.73) compared with vancomycin. Finally, we examined 30-day outcomes for MSSA patients who were initially excluded from the analysis: 2387 patients who returned from hospitalization and 599 patients who were started on antibiotics more than 1 week after blood cultures were drawn (Supplemental Figure 1). In this population, cefazolin was still associated with reduced hospitalization or death from infection compared with vancomycin (HR=0.55, 95% CI=0.42–0.71). This nationwide US surveillance of community hemodialysis patients indicates that vancomycin is the most commonly prescribed antibiotic for the treatment of MSSA bloodstream infection, whereas cefazolin may be more effective than vancomycin at reducing the combined risk of death or hospitalization for infection from this organism. Vancomycin was approved by the US Food and Drug Administration in 1958 but was sparingly used in its first 10 years because of ototoxicity and nephrotoxicity.16 Additionally, less toxic antimicrobials that contained ß-lactam rings became available around the same time, such as methicillin, which was also FDA-approved in 1958; and followed thereafter by cephalothin, a first generation cephalosporin.16 Vancomycin use increased by >1000-fold from 1980 to 2000, when MRSA infections became widespread in the general population.16 With increased use came data that confirmed that vancomycin had broader activity on Gram-positive organisms than ß-lactam–based antibiotics, but data also questioned the relative effectiveness of vancomycin.10,13,14,17–23 In vitro studies reported delayed S. aureus eradication with vancomycin over naficillin in isolates recovered from patients with endocarditis that were refractory to treatment with vancomycin.21 Several studies supported observations that vancomycin was clinically less effective than ß-lactam agents in the treatment of MSSA bacteremia in the clinic.10,13–15 Most notably, the work by Chang et al.10 reported that naficillin was superior to vancomycin at preventing the persistence or relapse of MSSA bacteremia in a multicenter observational study of 505 patients without kidney disease. Among hemodialysis patients with MSSA bloodstream infection, most outpatients were initially administered vancomycin when blood specimens were collected. Unfortunately, most outpatients also remained on the drug 1 week later, a time when antibiotic susceptibilities were available. A minority of MSSA bacteremic patients were treated with cefazolin, which was associated with a significantly greater reduction in hospitalization and death from infection compared with vancomycin. Despite this association, vancomycin prescription in MSSA bacteremic patients increased substantially over the 5-year study period. Conversely, cefazolin prescription decreased over the same time period. There are several potential explanations for this paradoxical finding. First, although MSSA may be sensitive to both vancomycin and cefazolin, it may not be widely appreciated that cefazolin may be more effective at eradicating bloodstream infections over vancomycin.10,13–15 Second, studies in dialysis patients have indicated that cefazolin can be safely and therapeutically dosed three times per week in hemodialysis; however, the pharmacokinetics of cefazolin in renal failure have not been well disseminated.28–30 Indeed, the half-life of cefazolin increases with renal failure, which parallels the prolongation of drug clearance reported with vancomycin in ESRD, and cefazolin can also be therapeutically administered three times per week.27 Overall, there are large practice disparities in the prescription of antibiotics to treat S. aureus bloodstream infections in the ESRD population, and these differences may contribute to excess infection-related morbidity and mortality. There are currently no renal practice guidelines for the treatment of bloodstream infection in dialysis that would likely decrease such clinical variability in infection care. There are limitations to our study. First, our large and diverse surveillance population allowed us to summarize the antibiotic selection practices in ESRD outpatients, but we did not have inpatient microbiology results; thus, our findings cannot be extended to patients treated in hospital. Consequently, we could not report an overall bacteremia rate (inpatients and outpatients), and we could not identify who was admitted for catheter exchange in the treatment of their bacteremia. Second, unmeasured confounding remains possible despite balance between antibiotic groups, where little difference in age, comorbidity, catheter rate, and vancomycin minimum inhibitory concentration was apparent. For example, there could be unmeasured variations in clinical practice, and we could not account for such center effects in our analysis. Third, confounding by indication remains possible where patients with more serious infections may have been preferentially prescribed vancomycin. Fourth, not all patients had vancomycin serum levels drawn, and it was not possible to verify that all patients received adequate therapy. Fifth, many antibiotic groups (cefazolin in MRSA) had very few patients and outcome events; consequently, effect estimates from such small groups may be less accurate and more volatile. In many of these cases, there were sparse data cells such that the statistical model would not converge. In conclusion, our data provide a snapshot of antibiotic selection practices in the US dialysis community for the treatment of S. aureus bloodstream infection. They suggest that vancomycin is commonly used to treat MSSA bacteremia in outpatients receiving chronic dialysis at the risk of more treatment failures than those outpatients receiving a ß-lactam antibiotic such as cefazolin. Between January 1, 2006 and December 31, 2010, 293,094 US ESRD patients received chronic hemodialysis within the Fresenius Medical Care North America (FMCNA) network of outpatient clinics. FMCNA is currently the largest US provider of chronic renal replacement therapy, with over 1900 clinics in 48 states, the District of Columbia, and the Territory of Puerto Rico. Accordingly, approximately 30% of the US chronic dialysis population was represented in this surveillance cohort. We performed a case surveillance study to identify S. aureus-positive blood cultures in outpatients on hemodialysis, their concurrent antibiotic therapies, and their associated morbidity and mortality. Case identification and clinical data were prospectively collected in the study clinics and then archived into the FMCNA clinical research database for subsequent analysis. Analyses were stratified by sensitivity to methicillin in the infecting strain of S. aureus. Subjects with multiorganism-positive blood cultures were not included in the analysis. Among case patients identified with S. aureus bacteremia, standard time series analyses were used to graphically depict the primary outcome: prevalence of vancomycin, cefazolin, and other antimicrobial prescriptions from the time that the blood culture was collected (time=0) and the next 5-week period. Prevalence was defined as the sum of bacteremic subjects receiving a given antibiotic divided by the total number of bacteremic subjects who were receiving outpatient hemodialysis treatment at a given point in time. Bacteremia rates were defined as the sum of bacteremic cases divided by the total number of outpatient dialysis days. Cases were also classified by their prescribed antimicrobial (vancomycin, cefazolin, or other antibiotic) on day 7, when microbiology and sensitivity reports were finalized. Cases that were hospitalized, died, or transferred to another dialysis clinic before day 7 were excluded from the analysis. Subjects receiving fluoroquinolones, higher generation cephalosporins, solely aminoglycoside therapy, macrolides, and daptomycin were few (<5% of the population) (Supplemental Table 2), and they were aggregated into the other antibiotic group because there were not enough outcome events for statistical convergence. The secondary outcomes included (1) combined risk of hospitalization or death from infection, (2) sepsis, (3) all-cause hospitalization, and (4) all-cause mortality at 30 days. Accurate records of hospital admission and death were maintained in the dialysis facilities by nurses who were required to obtain discharge summaries and death certificates for all patients.31 From these documents, the nurses ascertained the cause of hospitalization or death for entry into the data records under predefined diagnostic categories. As such, we identified patient events for sepsis, abscess, endocarditis, peritonitis, meningitis, or infectious disease from the bone, joint, skin (cellulitis), urinary tract, respiratory system, auditory canal, eye, intestinal tract, implanted device, or other bacteria/microorganism for this study. We also examined the subsequent 1-year risk of vancomycin-resistant bacteremia defined as a positive vancomycin intermediate S. aureus (minimum inhibitory concentration [MIC]=4–8 mcg/ml), vancomycin-resistant S. aureus (MIC≥16 mcg/ml), vancomycin intermediate enterococcus (MIC=8–16 mcg/ml), or vancomycin-resistant enterococcus (MIC≥32 mcg/ml) blood culture. At the time of the study, dialysis facilities were equipped to collect blood culture specimens from patients when they received their routine dialysis treatment, which typically occurred three times per week. Blood culture requisitions required physician orders, and the nursing staff was trained in a uniform blood specimen collection protocol by the Clinical Services Unit of FMCNA. Cross-contamination reduction procedures were in place. Nursing staff used full gown, facemask, shield, and clean gloves. All specimens were drawn from the arterial port of the bloodline, and therefore, sampling included outflow from the patient’s vascular access. Both the arterial bloodline port and the culture bottle rubber septum were cleansed with povidone iodine before blood culture collection. Blood culture bottles were stabilized in heat-insulated transport boxes for overnight courier to a centralized and certified microbiology laboratory (Spectra Laboratory, Rockleigh, NJ). Bottles were cross-checked for identification on arrival by Central Laboratory Handling Staff and monitored for microbiological growth in real-time using BacT/Alert instruments. If growth was detected, blood samples were immediately Gram-stained and plated on TSA Blood Agar plates for speciation and antibiotic susceptibility testing. Cultures were reported negative if no growth was seen after 5 days. All results were securely stored in electronic data records for future retrieval. Positive blood cultures, microbial speciation, and susceptibility results were immediately (overnight and weekends included) communicated to the dialysis unit and the ordering physician or designee by telephone as panic values. Antibiotic administration (dose and class) was charted for individual patients on a per treatment basis. Medication records were routinely reviewed and reconciled by a designated facility nurse after each treatment shift and before the data were aggregated and archived. If blood specimen collection was indicated, the staff was instructed to draw cultures before antibiotic therapy was administered. Vancomycin trough levels were measured before the initiation of dialysis treatment and the administration of subsequent antibiotic doses. Throughout the study period, antibiotic prescription, dosing, and serum level monitoring were at the discretion of the attending nephrologist. There were no formulary restrictions or guidelines on the use of vancomycin, cefazolin, or serum level monitoring. We used SAS statistical software (version 9.1) with SQL pass-through queries to extract de-identified clinical, hospitalization, death, microbiology, and drug administration data from the FMCNA research database. The data were pooled, cleaned for outliers, and then statistically analyzed. Chi-squared statistics were used to compare the prevalence of vancomycin, cefazolin, and other antibiotics used in the surveillance population. Pearson correlation coefficients were used to determine if the annual prevalence of vancomycin, cefazolin, and other antibiotics changed significantly over time (from 2006 to 2010). For the secondary outcome analyses, subjects were grouped by their treating antibiotic (vancomycin, cefazolin, or other antibiotic) that was documented at 1 week after blood culture specimen collection. Standard demographic, vital signs, vascular access, laboratory, and comorbid baseline characteristics were compared between antibiotic groups (chi-squared and t tests). Cumulative event rate curves by treatment group were generated using Kaplan–Meier methodology. Covariate adjusted HRs (95% CI) were calculated using Cox regression for time to hospitalization/death from infection, sepsis, all-cause hospitalization, all-cause mortality, and subsequent vancomycin-resistant bloodstream infection. Model covariates are the parameters listed in Tables 1 and 2 with the exception of drug allergies. The effect of such drug allergies was tested in subsequent survival models that excluded patients with penicillin and cephalosporin allergies. Hypothesis tests were two-sided, with an α level of 0.05. Three additional sensitivity analyses were performed. Primary and secondary outcome estimates were recalculated after patients with a penicillin or cephalosporin allergy were excluded from the study cohort. Documented drug allergy is an accepted indication for choosing vancomycin therapy in MSSA bacteremia. Because repeated bacteremia may indicate a more complicated infection, we also recalculated the risk of hospitalization or death from infection after excluding patients who had a preceding positive blood culture in the previous 60 days. Finally, we examined 30-day secondary outcomes in patients who were excluded from the main analysis, because they were hospitalized or not treated on day 7 after blood culture collection. K.E.C., J.L.H., and F.W.M. are employees of Fresenius Medical Care North America. R.I.T. is a consultant for Fresenius Medical Care North America. The authors graciously thank Spectra Laboratories (Rockleigh, NJ) for assistance in this study, including Dr. Shelden Rosenblum, Dr. Chinu Jani, and Ms. Julie Brennan. This article contains supplemental material online at http://jasn.asnjournals.org/lookup/suppl/doi:10.1681/ASN.2012010050/-/DCSupplemental.